Prince William and Kate Middleton took 8-month-old Prince George on the first official public engagement of their 19-day tour of New Zealand and Australia. The Duke and Duchess of Cambridge met fellow new mothers and fathers at Government House in Wellington along with not-for-profit childcare organization Plunket. The parents were selected to reflect the diversity of New Zealand society. 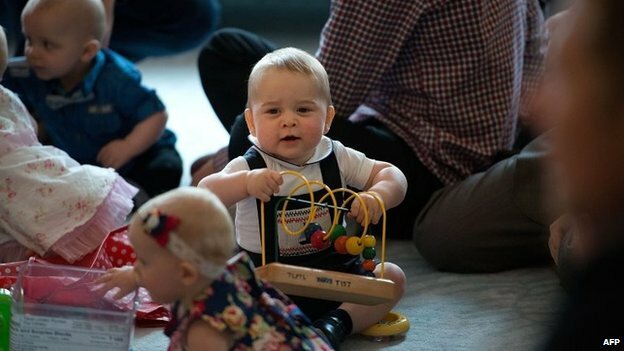 Prince George appeared to remain calm even though there were tears from some of a similar age. Prince George went on a crawl-about with other children in the Blandor Room which had a large portrait of his great-grandmother, the Queen. Prince William and Kate Middleton chatted informally with the parents of 10 babies, including a pair of gay fathers and a single mother. Prince George was dressed in a blue dungaree shorts by British luxury brand Rachel Riley, a white blouse and soft blue pre walking shoes. The idea was to give the royal couple the chance to introduce the young prince to the world in a less formal way than usual. They also had the chance to swap experiences with other first-time parents. Tristine Clark, New Zealand president of Plunket, said: “The parents are a spread of all the communities in New Zealand, including Maoris, Samoans, people of Chinese descent and gay couples. The Royal New Zealand Plunket Society, widely known as Plunket, was founded in 1907 by paediatrician Sir Frederic Truby King.